I may have a call, but you can be a missionary all the time. Take a look at Al Fox, a 24/7 missionary, to learn what it means to live your faith and use the internet for good. I accept my call to the Brazil Santos mission. I am filled with gratitude at this opportunity. I am so humbled to be entrusted by Heavenly Father to testify of Christ to the people of Brazil and I couldn’t be happier. I give myself over to the Lord’s will. Thank you for this opportunity. Opening my call was probably one of the most spiritual experiences I have ever had. Everything else fell away when that envelope was in my hands. This was it. I was being called to be a missionary. I received the call in the mail on Wednesday, July 17th. My younger brother, Riley, was going to be out of town until the next day. I had to wait over 24 hours to open the envelope that was going to change my life! I felt as though I was going to jump out of my skin! What’s worse than having to wait to open the call that you have waited years for? Having to go to math class right before opening the call. We were having a big review before a big test. Take a guess on how I did on that test. Let’s just say it is a miracle that I passed that class with that test score on my record. I arrived home from math class, and my family and a few of my friends had gathered at my house. Their beaming faces mirrored my crazed excitement. I stood with the big white envelope in my hands. I had prayed for this moment for years. I had prayed to be given a hint of where I might end up (to no avail…) and it was finally happening! 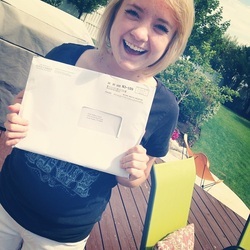 I tore open the envelope with reckless abandon and read: “Dear Sister Culley, You are here by called to serve as a missionary of the Church of Jesus Christ of Latter-day Saints. You are here by assigned to labor in the BRAZIL SANTOS MISSION!! !” It felt as though the world had stopped. Everything seemed brighter and clearer. It felt as though I had known the answer all along and that there was no other option. Afterward something happened that I would cherish the rest of my life. My Grandpa Culley, who was nearing the end of his life at the time, hugged me with tears running down his cheeks and soaking my shirt. He told me that I would be a great missionary. He told me how much he loves me. Then he said that he would be with me always. I feel his spirit everyday. His example fuels my determination to be a missionary 24/7 like he was. If you are struggling waiting to get your call don’t ever forget that if you have the desire, you are called to the work! Your missionary work can start now! Cherish that moment of clarity when you open your call. Pray that you will love wherever you are called and that the people will accept you. God be with you! A Journal Entry from the Day Before I Opened the Call. I am so filled with an overwhelming joy that comes with the opportunity to testify of Christ and His wondrous message! Tomorrow I will open my mission call and find out where I will be serving for the next 18 months. I find myself not caring where that call will send me, but only the fact that I’ll be going to testify of Christ. When I think of the joy that I find in Christ’s Gospel I marvel at the fact that he trusts and loves me enough to be his messenger. I myself and weak, but through Christ I am strong. When I am able to see myself the way He sees me I am brought to tears. The world and Satan would have me believe that my skin isn’t clear enough, my smile not bright enough, my size too small or too heavy, and my complexion too white and pale. But through Christ’s eyes I see a daughter of God filled with His light and everlasting love. I see someone who’s smile is filled with the knowledge that what I do matters. I see a girl who walks among angles and speaks with the power of the Holy Ghost. I am all these things and more because He made me that way. The very thought that I reside in the Great Creator’s thoughts and heart brings me to my knees. I can only be all this through the atoning blood of my brother and savior, Jesus Christ.